Angelina Jolie was born on June 4, 1975 at 09:09 PDT in Los Angeles, CA (34 N 09 / 118 W 26) (source: AstroDatabank, Rodden Rating AA). When assessing a horoscope, we always look at the standouts, things that are missing and things that are, on the contrary, overly present. In short, we are looking for factors that are out of balance. Not to overwhelm you with information, we will assess the horoscope of Angelina Jolie by looking at the factors that only have some meaning for her love life. The Ascendant, Venus and Uranus at the same degree can be best delineated by blending the meaning of these three planets together. If you find it difficult to delineate the combination of three planets or points, we recommend following the method used by the Schools of Cosmobiology and Uranian Astrology in their midpoint analyses. These schools always delineate a combination of three or more planets and you will find the descriptions listed in Reinhold Ebertin's stunningly accurate "The Combination of Stellar Influences", Alfred Witte's groundbreaking "Rules for planetary-pictures: The astrology of tomorrow" or the Appendix II of Noel Tyl's popular "Solar Arcs" MOST helpful and often ingenious. If you're really into astrology or are planning to delve deeper into it, you will never want to miss Reinhold Ebertin's and Alfred Witte's books! So, when the Ascendant, Venus and Uranus come together they denote (among others) sexiness, an intense flair and attractiveness to others, some "show off", sudden feelings of love or love at first sight. Angelina Jolie will almost always fall in love with anyone! This trio points to a very detached and independent personality. It's a very artistic combination too. Very exact aspects are most important as their influence will dominate the whole life and character of the native. The Sun and the Moon in an exact incoming sextile denote a very freedom-loving character with humanitarian interests (the incoming sextile has an 11th house meaning). Angelina Jolie can't stand to be pinned down and wants total freedom and needs a lot of (superficial) social contacts. Because of the waning sextile, she's very interested in 'children of the others.' (another 11th house meaning). The exact Mars-Neptune trine at 10° in a sign signifies loss of energy sooner or later. Her energy will drain and there may be periods in her life that bring a loss of focus. The Mars-Neptune combination in fire signs does give plenty of energy though, but it goes till exhaustion and is meant as an escape mechanism. When Jupiter, Saturn and the MC are at the same degree we have to do with someone who loves to change the place and domicile. Also, she will always be happy on her own and will never mind separating or parting which will only make her more happy. The combination is quite a philosophical one too! Between brackets, it's interesting to note that Saturn is the ruler of her 7th house of partnerships and is in its detriment in Cancer in the 12th house square the Moon, its own dispositor, which is a very bad situation regarding marriages! Also note that Uranus, the co-ruler of her 7th house squares her 7th house cusp (Descendant) denoting some rebellious behavior which may upset others (and the partner). All planets below the horizon are retrograde which may denote uneasiness within tight family situations. It's not recommended that she involves in domestic affairs. Any planet or point at 0° in any sign, shows a new beginning. 0° Sagittarius brings a whole lot of connections (symbolism of the North Node). You may recall that Britney Spears has Uranus at 0° Sagittarius and that we wrote that "0° Sagittarius is quite a positive (and very public) degree. Mostly it denotes fortunate developments, power and renown." With the Node in this position, she has (changing) connections to a whole lot of successful people too. When Venus rises and Jupiter culminates, we have a configuration that makes very popular. Venus and Jupiter together always do point to popularity! In Angelina Jolie's horoscope both planets bound the 4th Quadrant (signifying our society). She's popular in society because she has the looks (Venus on her Ascendant) and wants to bring a message to the world (Jupiter on the MC). the Moon conjunct the Fixed Star Alpheratz denotes the need to feel free and move wherever she wants. Also, Alpheratz is an indication of good fortune, wealth, honours, freedom, and love. It brings about a good relationship to other people and makes for popularity and can lead to becoming well known in public. Mercury conjunct the Fixed Star El Nath is said to be an important indication of success, eminence and fortune. A dominant Fire element and a totally lack of (fixed) Earth indicate lots of drive, impulses and urges. It also signifies that she takes a lot of initiatives without being able to sustain energy till the end. Angelina Jolie definitely lacks persistency. In a female chart an exaggerated emphasis on masculine (fire) signs can be problematic in relationships. Angelina Jolie clearly wants to conquer and push herself through. She may act in a very linear way and wants instant gratification. She will get mad when her desires are not met instantly. This is one of the indications in a female horoscope pointing to a turbulent and quite unstable emotional inner life often resulting in auto-mutilation and self-destruction. This is confirmed and even reinforced by the tight Moon-Mars conjunction in Aries opposite Pluto, ruler of her 5th house. What do we know about Angelina Jolie's love life? In 1995 Angelina Jolie met the British actor Jonny Lee Miller (born on November 15, 1972 in Kingston, England, UK) on the set of the film "Hackers", and on March 28, 1996 they got married. They separated in October 1997 and were divorced February 23, 1999. It's told that at her wedding to Miller she had displayed her husband's name on the back of her shirt painted in her own blood. On May 5, 2000 she married "Pushing Tin" co-star Billy Bob Thorton (born in Hot Springs, Arkansas on August 4, 1955) at the Little Church of the West on the Las Vegas Strip and acquired three step children. On July 17, 2002 Angelina Jolie filed a Petition for Dissolution of Marriage in the Los Angeles Superior Court. They officially got divorced May 27, 2003. She met current boyfriend Brad Pitt in late 2004 or early 2005 on the set of "Mr. and Mrs. Smith." On May 27 or 28, 2006 they both had a daughter. Let's take a look at her Marriage Graphs for 1996 and 2000 for a moment. 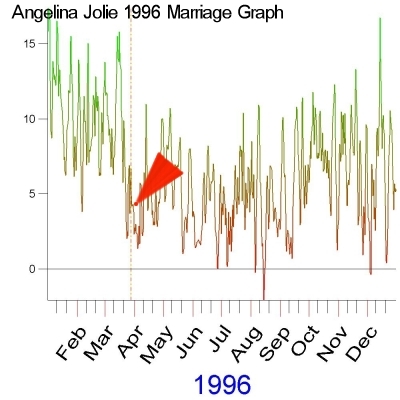 The red arrows point to the dates of marriage and the Graphs clearly show Angelina Jolie twice married on the wrong dates! 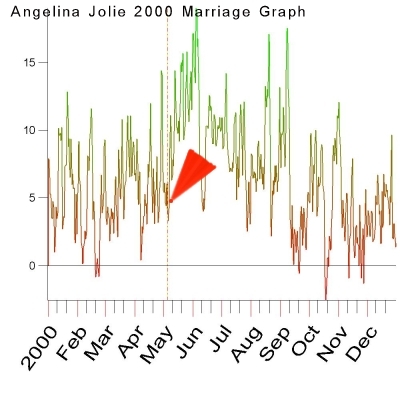 You better never marry on a date the Marriage Graphs are in red or going down. Once more this is a proof of the validity of our own researched algorithms. Click here if you want to know how to get Your Marriage Graphs. When we at Cosmic Technologies analyze horoscopes we often consult Astrodamus 1.0™ to know what the future may hold for the native. The first thing we do is trying to find out if the time of birth is accurate by letting the automated rectification module of Astrodamus do its work. However, when we entered the dates of Angelina Jolie's marriages, divorces and the birth of her daughter, the automatic rectification module came up with too many possible times. Every time Astrodamus lists many possible times, don't use one of them and stick with the original time. And that's what we did. Most predictive blocks during 2006-2008 point to problems/separation in the immediate family (in different blocks these words are repeated over and over so that this surely will work out), real-estate transactions and some problems with children (or her child). Clearly, Astrodamus 1.0™ predicts something to happen in the family and/or with real estate during the overlapping time frame of both blocks! They may move or relocate or buy a new house. How will Angelina Jolie fare according to Astrodamus? Update July 2008: Angelina Jolie reportedly gave birth to twins on Saturday July 12, 2008 in the Lenval Hospital in Nice, France. According to a reuters press report, she delivered a boy first (Knox Leon) around 06:27 pm (18:27) by Caesarean section, followed within a minute by a girl (Vivienne Marcheline). According to the medical staff, the Caesarian was moved forward for medical reasons. Update April 13, 2012: Reportedly, Angelina Jolie and Brad Pitt are engaged. There is no marriage date set though. Update May 14, 2013: Angelina Jolie revealed that she had 2 preventive mastectomies in February 2013 followed by reconstruction with implants in April 2013. She also told that her decision was based upon the fact that she carries a defective BRCA1 gene. She had three operations: on February 2, 2013; on February 16 for the 2 mastectomies and on April 27 for the reconstruction. Rumors go she will also plan to remove her ovaries. 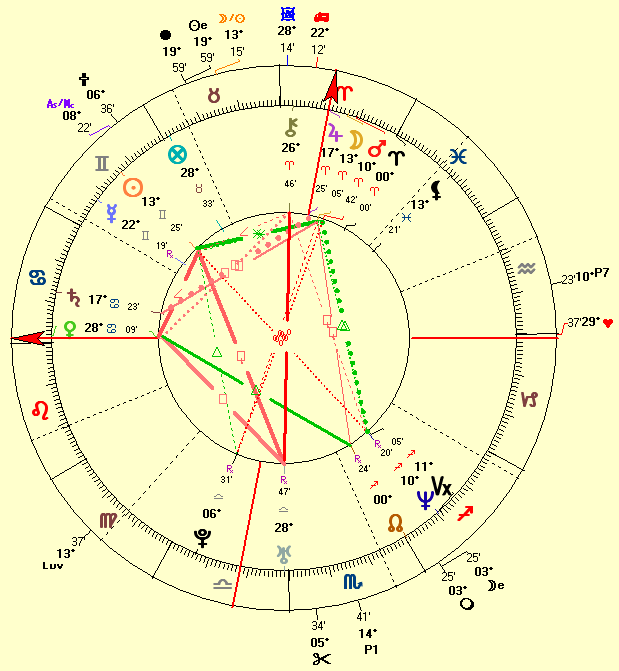 Note how her natal chart shows such a fear-driven personality (reinforced by the powerful Moon-Saturn connections) and a life of auto-mutilation and self-destruction (reinforced by the Moon-Mars connections). Update August 28, 2014: Reportedly, Brad Pitt and Angelina Jolie were secretly married in a private ceremony attended by family and friends at their Château Miraval home in Correns (Var area), France. The marriage took place on Saturday August 23, 2014. In advance of the nondenominational civil ceremony, Brad Pitt and Angelina Jolie also obtained a marriage license from a local California judge. The judge also conducted the ceremony in France. This is a second marriage for Brad Pitt – he was divorced from Jennifer Aniston in 2005 – and a third for Angelina Jolie. She was previously married to the actors Jonny Lee Miller and Billy Bob Thornton. The couple began leasing Chateau Miraval in 2008 and bought it three years later. The sprawling property has its own vineyards and a tiny chapel in the grounds with standing room for around 20 people. Update March 24, 2015: Reportedly, Angelina Jolie made the decision to have her ovaries and fallopian tubes removed as a preventative measure in March 2015. After weighing her options, just as she did before getting a preventative double mastectomy in 2013, she decided to go forward with the surgery because she carries a gene that gave her a 50 percent risk of developing ovarian cancer. "In my case, the Eastern and Western doctors I met agreed that surgery to remove my tubes and ovaries was the best option, because on top of the BRCA gene, three women in my family have died from cancer," Jolie wrote. "My doctors indicated I should have preventive surgery about a decade before the earliest onset of cancer in my female relatives." "Last week, I had the procedure: a laparoscopic bilateral salpingo-oophorectomy," wrote Jolie. There was a small benign tumor on one ovary, but no signs of cancer in any of the tissues. Angelina Jolie kept her uterus because there is no history of uterine cancer in her family. Our comment (without judgement): we repeat that her natal chart represents a highly fear-driven personality (reinforced by the powerful Moon-Saturn connections) and a life of auto-mutilation and self-destruction (reinforced by the Moon-Mars connections). FEAR is highly self-destructive and she's a tragic example of all this! Also know that the theory about genetic diseases may be wrong. More and more evidence points this out (the study of this is called Epigenetics). Your mind(set) can change quite a lot! Update September 20, 2016: Reportedly, Angelina Jolie has filed for divorce from Brad Pitt. The actor and director cited irreconcilable differences as the cause for the split. Jolie has reportedly asked for physical custody of their six children, with Pitt allowed visitation rights. The date of separation is listed as 15 September 2016. Astrologically, transiting Saturn at 10° Sagittarius and transiting Neptune at 10° Pisces are at the same numerical degree as natal Mars and Neptune (in Brad Pitt's natal chart, both transiting planets are at the same numerical degree as Mars and Uranus!). This can be a very paranoid pattern but also a highly threatening one. This fully clarifies why both partners separate just now: 10° in a sign is for both a highly sensitive and turbulent degree.